Leffe is a passionate human being. He is totally engaged in what he is doing. The Moose have become his friends, his herd, his family. Since Gunde and Göta first arrived, his life as a farmer has become radically different. Leffe spends a lot of time with the Moose, especially so in the spring when the new calves are born. He sleeps out with them and stays close, often even during the birth, to get the new-born calves used to him and to being in contact with humans. Leffe does all the guided tours himself unless he is really ill or voiceless. He is a very lively and entertaining person who tells his story and introduces you to the Moose in his own special way – his enthusiasm is contagious! He is a living encyclopaedia when it comes to facts about the Moose – you can ask him anything. 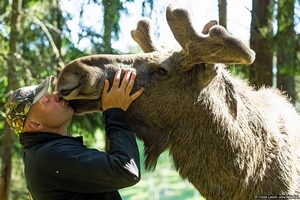 He is the first and only man in the world to swim with his Moose and he has starred on many TV-programmes all over the world. Leffe also lectures about his company and his entrepreneurship. *Book online and get 20sek discount and guaranteed seat. Tack för den mest spännande dagen i mitt liv! Att träffa älgarna var det häftigaste jag varit med om någonsin. Alla borde åka hit! Vilken härlig park! Härliga djur o vilken fantastisk kille att bjuda på sig själv under guideturen! Riktigt roligt!!!! Tummen upp!!! Tänk att det kommer så mycket folk till lilla "Gåvan" tack vare älgarna. Fantastic time! So much care to every detail. Impressive place and still very quiet. Jag och min familj tackar er för en trevlig dag med älgsafari och ett fantastiskt gott julbord.